According to the website TampaBay.com, the 2010 World Series of Poker Main Event runner-up John Racener was pulled over at around 4AM Saturday morning in Tampa Bay, Florida and was charged with Driving Under the Influence (DUI) after he refused to take a breathalyzer test. Racener was later booked into the Hillsborough County Jail and then released on $1,000 bail, jail records show. The incident took place on Azeele Street and S Westland Avenue. This is the 24 year-old Racener’s third DUI charge – In addition to Saturday’s arrest he was charged in 2005 at the age of 19 and again in 2007– and is his fourth arrest overall –he was also charged with misdemeanor battery in 2009 according to TampaBay.com. Being his third arrest for DUI Racener could possibly face up to 12 months in jail under Florida law. 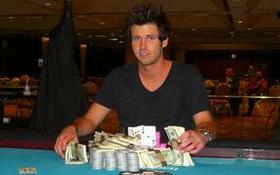 Racener won $5.5 million for his 2nd place finish to Jonathan Duhamel at the 2010 WSOP Main Event, and was signed by the popular online poker room Full Tilt Poker to boot. Just last week Racener pocketed another $272,000 for his 4th place finish at the WPT Five Diamonds Poker Classic. Overall Racener has won over $7 million in poker tournaments according to theHendonmob.com. This entry was posted on Monday, December 13th, 2010 at 7:22 am and is filed under Poker News. You can follow any responses to this entry through the RSS 2.0 feed. You can leave a response, or trackback from your own site.